Last week 16 Fisker Karma's caught fire and burned after being submerged under Hurricane Sandy flood waters while waiting in an automobile processing yard in Newark NJ, and the main battery pack was ruled out as the cause of the fire. Last week in the middle the Hurricane Sandy turmoil, news came out that 16 Fisker Karma's had burned in a storage yard that had flooded during that storm. While the initial reports were sketchy, there were pictures of alarming fire damage. On Monday, a Fisker spokesperson sent out an update based on an investigation carried out with the NHTSA about fires not only in the Fisker Karma's but several other cars that were in the same storage yard. The initial report came in an article posted on Jalopnik, citing unnamed sources who said that 16 Fisker Karma's had caught fire, and Jalopnik said one of their sources claimed the cars had exploded. If one were to jump to conclusions one might think this had to do with the battery pack, except that the pictures showed the majority of fire damage in the front of the car (where the gasoline engine resides) rather than the rear where the electric drive train resides. A later report by the NY Times found that three Toyota Prius's in the same storage yard burned or smouldered, with a Toyota Prius Plug-in burning. That same report noted the cause of the fire could be very simple. Salt water is much more conductive than fresh water, which could form a circuit causing a release of energy stored in a battery, and that energy release could make things hot enough to cause a fire. The statement supplied by a Fisker Automotive spokesperson (below) is consistent with those observations. The "low voltage control unit" would be involved in running the 12 volt system. After being submerged deep underwater, one Karma caught fire due to a short circuit, and that fire then spread to nearby Karma's. The main battery pack was not to blame, but instead the battery in the 12 volt system. On October 30, following Superstorm Sandy, several electric hybrid and non-hybrid cars from a variety of manufacturers caught fire and were damaged in separate incidents after flood waters receded at Port Newark (NJ), including 16 award-wining Fisker Karmas. Port Newark is one of the largest vehicle handling facilities in the U.S., and many thousands of vehicles of many makes and models were severely damaged as a result of the unprecedented flooding. After a thorough inspection witnessed by NHTSA representatives, Fisker engineers determined that the damage to the Karmas was the result of the cars being submerged under five to eight feet of seawater for several hours that left corrosive salt in a lowvoltage Vehicle Control Unit in one Karma. The Vehicle Control Unit is a standard component found in many types of vehicles and is powered by a typical 12V car battery. This residual salt damage caused a short circuit, which led to a fire that heavy winds then spread to other Karmas parked nearby. There were no explosions as had been inaccurately reported. The Karma’s lithium-ion batteries were ruled out as a cause or contributing factor. 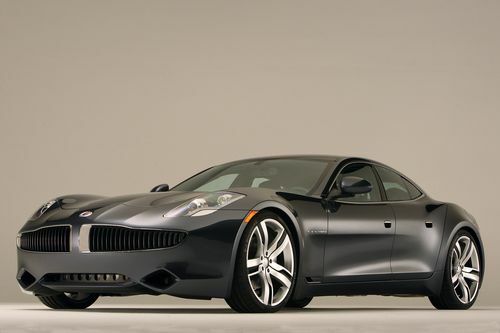 The Fisker Karma meets or exceeds all safety requirements for markets in North America, Europe and the Middle East. Fisker Automotive is the leading manufacturer of luxury Electric Vehicles with extended range and will continue to develop and market vehicles that deliver an unmatched combination of style, performance and economy. There is something missing in this story. Do Fisker and Toyota plug-in have DC-DC converters? These have battery pack input voltage and output 13.6 VDC to run accessories when gas engine isn't running. Their story has a big hole. Why did they not see all the gas cars catch on fire? They all have 12V batteries? The Fiskers in the pictures burnt to the ground, totally destroyed. I think that A123 batteries might release hydrogen sulfide when severely heated commonly call swamp gas and is combustible. Will there be more info released? Maybe because the DoT would not allow for a manufacturer to sell a battery in a car that can get wet and get on our roads. We don't work at the DoT, not at car manufacturing facilities but what we do know is that there is a lot of testing and shielding that goes into these cars before they can get on the road. No one's "lying" per se, I'm sure.